flora such as mycorrhizae) secrete organic acids and chelates that attack primary minerals in order to gain nutrients. The principal weathering-supplied nutrients are Ca, K, and Mg. 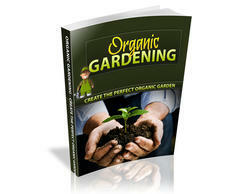 The nutrients that are liberated from minerals can be taken up by the growing plants or lost from the soil via drainage. When the plants eventually die, part of their nutrients are taken up by new plants, but part is also lost in the drainage. Over time the biogeochemical cycling of the nutrients results in loss to streams and eventually to the ocean. As a result, land plants accelerate the transfer of dissolved Ca and Mg, and associated HCO3-, from the continents to the oceans, leading to an increased uptake of atmospheric CO2 during weathering (reaction 1.1). bringing about silicate weathering (similar photomicrographs can be found in Berner and Cochran, 1998). Land plants can bring about enhanced weathering in additional ways. Organic litter accumulates in soil and undergoes microbial decomposition to organic acids and carbonic acids, which provide additional H+ and chelates for mineral dissolution. Plants recirculate water via evapotranspiration. For example, much of the rainfall in heavily forested regions, such as the Amazonian lowlands, is formed from the condensation of recirculated water transpired from the trees (Shukla and Mintz, 1982). In this way the trees act as natural soxhlet extractors whereby dilute recirculated water is constantly added to the soil for mineral dissolution. It is often stated that plant roots protect land from erosion, and this can be interpreted as inhibiting chemical weathering by keeping underlying bedrock minerals from being exposed to weathering. However, this applies only to areas where all primary minerals have been removed from the soil by weathering and removal of the soil cover is limited. In areas of moderate slope, plants hold soil against erosion and allow moisture adsorbed on clays to build up, which enables continued dissolution of primary minerals still disseminated in the soil (Drever, 1994). In the absence of vegetation, rapid erosion can expose bare bedrock, which holds less moisture, so that less weathering takes place because of shorter water-rock contact time. Although much has been learned about plants and weathering by studying modern ecosystems (e.g., Likens et al., 1977), what is needed in studying the Phanerozoic carbon cycle is the quantitative significance of plants as they affect CO2 uptake during weathering. Vascular plants invaded the continents during the early Paleozoic (Gensel and Edwards, 2001), but it was not until the Devonian that large plants with deep roots, such as trees, became really important. Large vascular plants must have weathered rocks faster than the algae, lichens, or bryophytes that preceded them (Berner, 1998). This is because trees have vast rootlet systems that expose a large interface between roots and minerals, allowing for the rapid uptake of nutrients to form large, fast-growing bodies. In contrast, even though there is evidence that they weather minerals (Barker and Banfield, 1996; Aghamiri and Schwartzman, 2002), lichens are small, have a small interface with rocks, and grow very slowly. Thus, for algae, lichens, and bryophytes there must be slower biogeochemi-cal nutrient cycling and, thus, slower weathering. The rarity of soils developed under lichens, as compared to those under trees, attests to the efficacy of trees in accelerating weathering to a much greater extent. The quantitative effect of trees, relative to mosses and lichens, on rates of weathering has been estimated by field experiments (table 2.1). This is a difficult task because it is necessary to hold constant all other factors that affect weathering, such as climate, relief, and lithology, to discern the vegetational effect. As a result there are only a few studies of this sort. 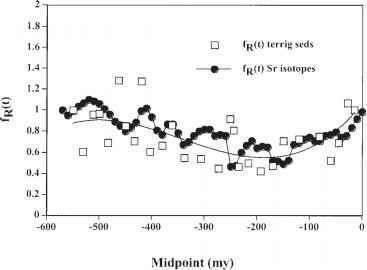 Drever and Zobrist (1992) used water chemical analyses to examine the rate of release of HCO3- from watersheds of relatively uniform granitic lithology and relief at different elevations in the southern Swiss Alps. They found that the weathering flux was about 24 times higher under forested land than that above the tree-line (where lichens and bryophytes are present). After correcting for the change of temperature with elevation as it affects weathering rate, their results show that plants accelerate CO2 uptake during weathering by a factor of about 8. Table 2.1. Ratio of weathering fluxes from vegetated areas versus areas sporadically covered by mosses and lichens. aTree storage plus runoff. bRunoff only. cCorrected for temperature by elevation. A dash means no data. The effect on release rate of total cations in drainage, by the presence and absence of forests on adjacent land areas, has been studied by Arthur and Fahey (1993) at a high-elevation granitic site in Colorado, USA, and their results indicate acceleration by the trees of a factor of about 4. The effect of trees versus mosses and lichens during basalt weathering has been studied by Moulton et al. (2000) in Iceland. Iceland was chosen for this work because small areas of forested and nonforested land were found adjacent to one another on the same rock type under the same relief, elevation, and microclimate. Also, Iceland receives no anthropogenic acid rain, and basalt weathering is especially important to the long-term carbon cycle because it consists of highly weatherable Ca and Mg silicate minerals (Dessert et al., 2001). Moulton et al. looked at the drainage release and storage in trees of Ca and Mg and found an acceleration of weathering by a factor of 3-4 over the adjacent moss-and lichen-covered ground (table 2.1). The data of Millot et al. (2003) suggest that there is an enhancement of silicate weathering rate by vegetation in the Mackenzie River basin of Canada. They found that the composition of stream waters from the lowland plains are enriched in dissolved organic matter compared to the mountainous headwaters and that the silicate weathering rates of the plains rivers are 3-4 times faster than the mountain rivers. (Because both areas are forested, their results are not listed in table 2.1.) Millot et al. explain this difference by weathering rates to the higher content of chelating organic compounds in the less well-drained organic-rich soils of the plains. The results of Millot et al. are of special interest to the study of the effect of plants on weathering because they show that differences in vegetation can complicate any simple correlation between relief and silicate weathering rate. A criticism is sometimes offered that weathering studies of young growing forests, as listed in table 2.1, do not take into consideration the ultimate attainment of thoroughly leached soils under old forests. Chadwick et al. (1999) have shown that after about 20,000 years of weathering, basaltic rocks in the Hawaiian Islands are leached of all nutrients, with the result that trees no longer weather bedrock and become dependent on rainfall and atmospheric dust for a continued supply of nutrients. Likewise, in the Amazonian lowlands, soils are so thick and thoroughly leached that bedrock weathering has essentially ceased, and the only supply of nutrients is that derived from the recycling of forest litter and dead trees (Stallard and Edmond, 1983). These are valid criticisms, but they only apply to flat ground. (The Hawaiian study examined only soils on areas with low slopes.) Most weathering takes place on hillslopes where there is sufficient gradient for removal of clay weathering products by physical erosion. In areas of high rainfall and high slope, landsliding is frequent and common (Stallard, 1995; Hovius et al., 1997), and this results in the uprooting and destruction of vegetation as well as the uncovering of fresh bedrock for continued weathering. Following landslides new trees are reestablished, and if the landsliding is frequent enough, the state of old forests with completely leached soils is never attained. It is often misconstrued that an increase in the rate of silicate weathering brought about by the rise of large vascular plants must have led to the production globally of greater quantities of soil clays and that this hypothesis could be checked by examining how the composition and abundance of clay minerals may have varied over the Phanerozoic (e.g., Algeo and Scheckler, 1998). This reasoning is incorrect because of the necessity of balancing the carbon cycle. The increased uptake of atmospheric CO2 by vegetation-assisted weathering must have been balanced either by greater inputs of CO2 to the atmosphere from volcanic/meta-morphic degassing and/or by other counterbalancing processes that decelerate the rate of weathering. As pointed out earlier, there is very little CO2 in the atmosphere-ocean system, and a small imbalance in the rates of CO2 removal and addition can lead to loss of all atmospheric CO2 in less than 1 million years (Berner and Caldeira, 1997). There is no evidence of an increase in degassing during the rise of the large vascular plants, so there must have been a deceleration of weathering due to another process or processes. The likely deceleration process was a drop in CO2 leading to a cooler earth via the atmospheric greenhouse effect. In this way the acceleration of weathering by plants was almost totally balanced by the deceleration of weathering by a drop in global mean temperature. The drop in CO2 was brought about by plant-assisted weathering, but it occurred only as a small leak in an otherwise well-balanced carbon cycle. After the rise of the large plants, a new steady state between atmospheric CO2 inputs and outputs was achieved at a lower CO2 level, but during the drop in CO2 the actual rate of weathering could have remained almost constant. Of further interest to the Phanerozoic carbon cycle is the rise of an-giosperms during the Cretaceous. How did this affect rates of plant-assisted weathering? Studies of modern ecosystems do not provide a clear answer. Moulton et al. (2000) found that in Iceland, the weathering of basalt was 50% faster for angiosperms (dwarf birch) than for gymnosperms (conifers) when normalized to biomass. Red alder (an-giosperm) forest in the western Washington Cascade Mountain foothills loses Ca and Mg eight times faster than adjacent Douglas-fir forest (gymnosperms) of similar age and biomass (Homann et al., 1992). In contrast, Quideau et al. (1996), studying two experimental ecosystems in southern California, concluded that gymnosperms (pine) release Ca and Mg from primary minerals faster than angiosperms (scrub oak). In an area of northern Minnesota, Bouabid et al. (1995) found that plagioclase, of fixed Ca/Na composition, exhibited approximately equal degrees of surface etch pitting in soils underneath stands of pine and oak-basswood. Augusto et al. (2000) inserted weighed mineral samples under a variety of stands of confers and hardwoods of northern France and found that after 9 years there was a distinctly greater mass loss of plagioclase under the conifers relative to the hardwoods. These results point to a need for further study using carefully defined experiments before anything can be said about how the rise of angiosperms may have affected the long-term carbon cycle. In GEOCARB long-term carbon cycle modeling (Berner, 1991, 1994; Berner and Kothavala, 2001), the effect of plant evolution is expressed in terms of the dimensionless parameter fE(t). The value of fE(t) is set equal to 1 for the present, representing angiosperm-dominated weathering. For the prevascular land-plant surface, a value <1 is chosen based on the field studies discussed above (for example, an acceleration of weathering of a factor of 8 would be expressed by fE(t) = 0.125). For the transition from a lichen/bryophyte world to that dominated by large vascular plants, the value of fE(t) is assumed to rise linearly with time for about 30 million years (380-350 Ma), reaching a new value at 350 Ma, characteristic of weathering by gymnosperms (plus more primitive vascular plants). During the Cretaceous, a 50 million-year transition (130-80 Ma) from the gymnosperm fE(t) value to fE(t) = 1 for a angiosperm-dominated world is assumed. After 80 Ma, fE(t) is assumed to stay constant at 1 (these ages are in agreement with the latest paleobotanical literature; see Willis and McElwain, 2002). Plant-assisted weathering can respond to changes in atmospheric CO2 because plants grow faster at higher CO2 levels. Many laboratory experiments (e.g., Bazzaz, 1990) have shown that plants fix more carbon at elevated CO2 if growth is not limited by water, nutrients, or light. If plants grow faster, they must take up nutrients faster, and, thus, weather rocks faster. In this way there exists a biological negative feedback effect of changes in CO2 on weathering rate. Evaluation of this effect for a natural forest has been done by Andrews and Schlesinger (2001). They irrigated portions of a North Carolina pine forest with elevated levels of CO2 and compared the flux of dissolved bicarbonate in soil waters under the irrigated and nonirrigated pine trees. They found a 33% increase in HCO3- release (in other words, weathering rate) for a change of atmospheric CO2 from 360 ppm to 570 ppm. 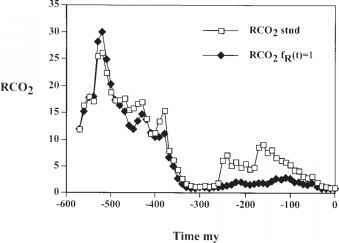 RCO 2 = mass of carbon dioxide in the atmosphere at some past time divided by the mass at the preindustrial present (280 ppm) n = exponent representing the efficacy of CO2 in fertilizing plant growth globally. The exponent n is used to indicate that plant growth at many localities is not affected by changes in CO2 because of limitation of growth by nutrients, water, or light. The value n = 0 means no fertilization globally, whereas a value of n =1 means that all plants globally respond to CO2 fertilization. A big problem, affecting both the modelling of the long-term carbon cycle and future predictions of rises in atmospheric CO2, is the value of n. A Michaelis-Menton formulation is used to express that there is a limit to plant productivity, and thus a response to increasing CO2, on land. Other more complex formulations have been offered (e.g., Volk, 1989), but equation (2.6) is used as a simple first approximation for a process that is poorly understood. where fnBb(CO2) is the weathering rate for a biota-free land surface divided by the same rate for a biota-free surface with the present level of atmospheric CO2. The subscript nBb refers to no biology. The question remains as to the applicability of equation (2.7) to a land surface populated by algae, lichens, and/or bryophytes. More experimental work is needed to discern the response of weathering brought about by these primitive organisms to changes in CO2. In the absence of such data, GEOCARB modeling assumes, as a first-order approximation, equation (2.7).